Breitling’s new Avenger Hurricane 12H features the world premiere of their Breitlight material (which was premiered before, but they are calling this their world premiere anyway..), which is similar in look and feel to the forged carbon cases out there. 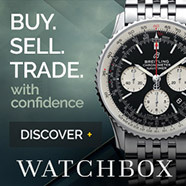 This is a pretty sweet case material to finally come out of the Breitling labs.. I just wish it wasn’t a cheesy name like Breitlight… they need to work on their names and take some tips from Apple. Otherwise, this is a pretty significant release from our friends at Breitling and I will be keen to see what other watches start coming out in this case material. The movement is the Caliber B01 and is very similar to the limited edition Hurricane 24H that came out last year… and like that beast this one also measures 50mm in diameter. Its a sweet looking watch, and I think if this was in a different case shape, maybe something like a Chronomat, with some better mix of materials I would be all over it. 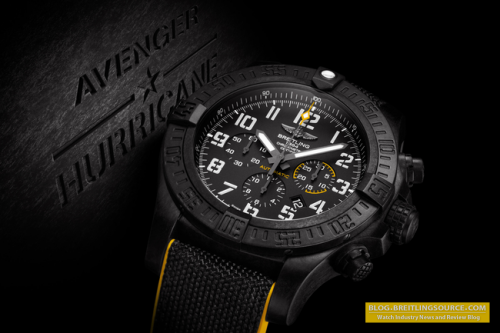 The Avenger Hurricane takes off in a new version in which the ultra-light, ultra-sturdy case in Breitlight® – a world-first – is teamed with a yellow or black dial and high-performance Manufacture Breitling Caliber 01. A chronograph built for extremes.